This is a short, intensive course featuring lively discussion and debate, small group exercises, video clips and real-world case studies to address the question from various points of view. We look at Borderline Personality Disorder (BPD) the particular point of view of social and mental health care workers, and examine how the issues around BPD might manifest in the real worlds of supported housing, in-patient mental health care or prisons. 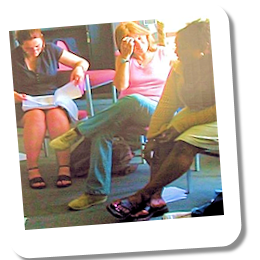 This intensive programme helps delegates understand the nature of BPD and introduces the BPD Toolkit to create simple,'do-able' techniques to work successfully with a group of people often rejected or discarded by services. We'll also be working hard to dispel myths, introduce the key treatment and support pathways, and look at how front line workers can play a key role in improving the lives of BPD service users. * Also known as Emotionally Unstable Personality Disorder. Confused? We explain all in the course! More about What is Borderline Personality Disorder? Borderline Personality Disorder (BPD) is perhaps the least well understood of the various forms of Personality Disorder, but is a common diagnosis among service users of the supported housing, criminal justice and community mental health sectors. There are many myths surrounding BPD, most of which are innacurate and unhelpful. For example, BPD is often over-associated with self harm, and can be seen by professionals as little more than 'attention-seeking' or a collection of behaviours deemed 'bad not mad'. BPD is more accurately described as a disorder which interferes significantly with an individual's ability to regulate emotions, establish and maintain healthy relationships, and make appropriate decisons. Substance misuse, offending, homelessness and social vulnerability are some of the potential pitfalls of BPD and why social care workers may be so familiar with this issue. This programme is best delivered as a one-day in house course for delegates requiring more intensive training, but can also be run as one of our Bite Size Courses. We can also deliver a Train the Trainer programme and Training Packs for this subject area. Not quite what you're looking for? Take a look at What is Personality Disorder? or Working with Personality Disorder Or just get in touch via our contact form, phone or email.